This Sunday's readings stress the limitless love of God in caring for his flock. Both our Old Testament and New Testament readings share similar encounters with God's mercy. In our first reading (2 Kings 4:42-44), the Prophet Elisha calls upon the power of God to feed a hundred people with only twenty barley loaves. After the people had eaten their fill, there was food left over. A similar scene with much deeper layers of significance is played out in today's Gospel passage. A man came from Baal-shalishah bringing to Elisha, the man of God, twenty barley loaves made from the firstfruits, and fresh grain in the ear. Elisha said, "Give it to the people to eat." But his servant objected, "How can I set this before a hundred people?" Elisha insisted, "Give it to the people to eat." "For thus says the LORD, 'They shall eat and there shall be some left over.'" And when they had eaten, there was some left over, as the LORD had said. In our Gospel reading (John 6:1-15), we hear of the multiplication of the loaves, the feeding of the five thousand. It is the only miracle story found in all four Gospels. John's telling of it is the most complete, with rich Eucharistic overtones and Old Testament references. Jesus, the Good Shepherd, is moved with pity for the multitude of people who followed him and his disciples to the mountain. The Eucharistic corollary is clear as Jesus took the bread, blessed it and distributed it. It can be said that the twelve baskets left over is one for each apostle as they go forth fulfilling their mission. Jesus went across the Sea of Galilee. A large crowd followed him, because they saw the signs he was performing on the sick. Jesus went up on the mountain, and there he sat down with his disciples. The Jewish feast of Passover was near. 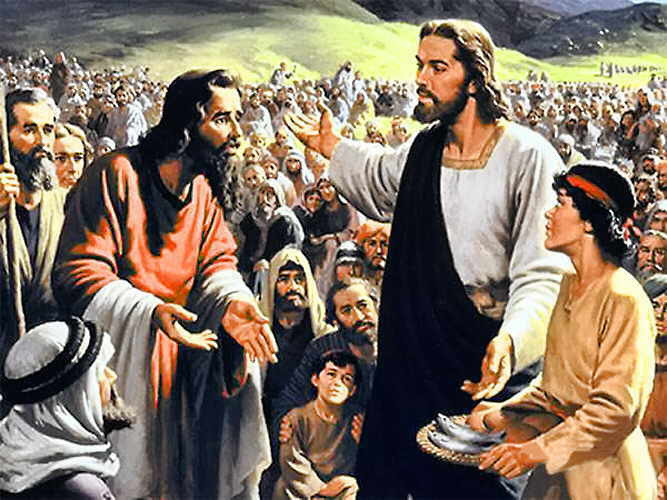 When Jesus raised his eyes and saw that a large crowd was coming to him, he said to Philip, "Where can we buy enough food for them to eat?" He said this to test him, because he himself knew what he was going to do. Philip answered him, "Two hundred days' wages worth of food would not be enough for each of them to have a little." One of his disciples, Andrew, the brother of Simon Peter, said to him, "There is a boy here who has five barley loaves and two fish; but what good are these for so many?" Jesus said, "Have the people recline." Now there was a great deal of grass in that place. So the men reclined, about five thousand in number. Then Jesus took the loaves, gave thanks, and distributed them to those who were reclining, and also as much of the fish as they wanted. When they had had their fill, he said to his disciples, "Gather the fragments left over, so that nothing will be wasted." So they collected them, and filled twelve wicker baskets with fragments from the five barley loaves that had been more than they could eat. When the people saw the sign he had done, they said, "This is truly the Prophet, the one who is to come into the world." Since Jesus knew that they were going to come and carry him off to make him king, he withdrew again to the mountain alone. In our Epistle reading (Ephesians 4:1-6), St. Paul explains what should be our response to God's grace - our calling to the unity of one people, one God, one baptism in one Spirit. This is how we are to live as Christians. Brothers and sisters: I, a prisoner for the Lord, urge you to live in a manner worthy of the call you have received, with all humility and gentleness, with patience, bearing with one another through love, striving to preserve the unity of the spirit through the bond of peace: one body and one Spirit, as you were also called to the one hope of your call; one Lord, one faith, one baptism; one God and Father of all, who is over all and through all and in all. Today's readings knit together Old and New Testament themes to reveal Jesus as the Messiah, the new Moses who has come to feed his people. While our readings mention physical food, the deeper meaning calls us to seek the spiritual food that is Christ himself, which is limitless in its quantity and efficacy. God's mercy and love knows no bounds. Our response, as St. Paul tells us is humility, gentleness, patience and love.